Differential cascode makes a good phase split job - with a SE input, gain is 26.0 in left, 25.8 in right part of pushpull. Bandwifth at 30 WPC continuous power into 8 Ohm (dummy load) is 5Hz - 100kHz (0..-1dB), unfortunately my audio oscillator cannot go higher. Too bad, Novosibirsk 6SN7 (6H8C) are audibly buzzing at around 5 kHz (at full power). I didn't risk going above 30 Watts continuous, anyway, it's a lot. I used a lot of junkyard parts (notably, the Nichicon 10,000uF - 200V caps), so the total cost per monoblock is less than 250 USD (including output tubes which are under $2 a piece here in the woods). Interstage caps are the lowly Soviet MBM paper type... not bad at all as long as there's enough DC across them. MBGCh canned paper type is good too. 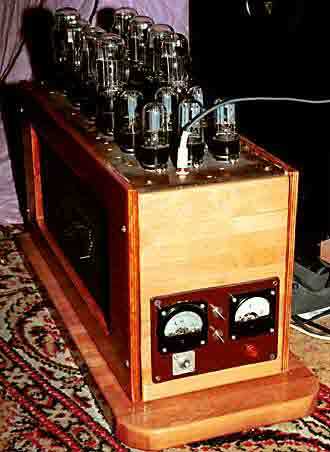 The amp is based on an H-shaped beech wood chassis (leftovers from Ikea kitchen job). Lower deck is for transformers (bottom), capacitors (bottom and top), and driver PSU (top). 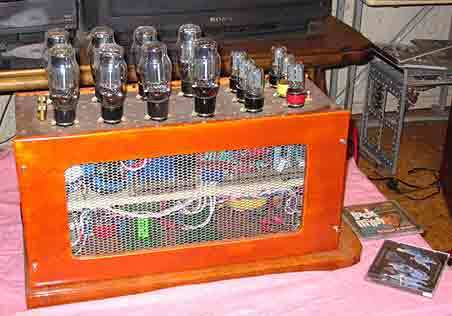 The upper board carries all the amplifier circuitry and tubes. here's a fragment of incomplete upper board. Cathode rails are 3mm copper wire, terminated directly to speaker terminals. Two bunches of red wires (plates) are terminated to capacitor screw post seen above. Other PSU wires (heater, driver power) terminate into military grade plugs for easy removal of the board. Original Atma-Sphere relies on the user to delay B+ with a separate switch. I used a simple timer to power driver B+ relay (45s delay) and output B+ relay (further 15s). Here's one half of 6AS7 plate supply with amperemeter. Probably, the most expensive part of the amp if the parts were new. Interesting! I used C-core dual-bobbin transformer for power stage B+. Wiring secondaries 'by the book' (A) to prevent core vibration, bandwidth was limited to 70kHz. 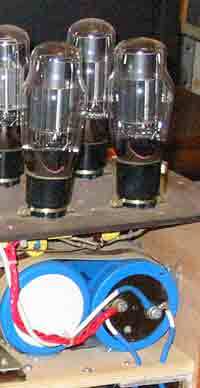 Re-wiring against the rules (B) extended treble to above 100kHz (-1dB). Having all meters and bias pots on the front is a must! On a lighter note, although I never test tubes before pluggoing in, I never had any fatal balancing errors or inability to balance with existing pot values. Once, after returning amp from an audition and replugging the tubes, I incidentally blew three of four tubes on one side. Not sure what caused this - probably, a way-too-off-center balance pot position. So how does it sound? Honestly, PRAT-wise it beats anything I heard (even horn-based systems). Small drums and cymbals are as realistic as they could be. The amp is quite revealing the source limitations. There's a feeling of 'No Power Limit' - hard to express it... the loudest bangs are reproduced without any strain, and don't mess up the subsequent quiet passages. You can hear the sound fading away into the long decay... and then there's a delicate hiss of an old master tape without any grain in it. What's wrong? 10-Ohm impedance. I can live without low bass (my ported speakers aren't good in it anyway), but the speakers' midrange impedance shapes frequency response in a very uncomfortable fashion: drop at 200-500Hz, peak at 1kHz, dip at 3kHz, back to level at 6 kHz. I trimmed down 1kHz peak with an RLC shunt, so the upper midrange is OK, but the 200-500Hz dip is unbeatable (speakers are a 2.5way JM Cobalt 815, the second woofer kicks in at 300Hz). What's next? I don't use it for as daily amplifier for a simple reason: Heat. 600 watts in tubes deplete room of any oxygen. This beast is for bigger rooms, definitely. But once a month I put the ugly thing on a stand, wipe out the dust and enjoy the sound for a few hours.... No limits.